The locally-produced and locally-oriented Sunday magazine cartoon was probably pioneered by the great Billy Ireland of the Columbus Dispatch, whose feature was titled The Passing Show. But Ireland was by no means the only one to ply that rare trade. Here we have a sample of Front and Center by Oswald "Oz" Black, cartoonist for the Minneapolis Tribune.Yesterday we covered his earlier effort, Here in Lincoln. Although Black wasn't as accomplished a cartoonist as Ireland, the innovative cartoonist he emulated, Black had a long career doing this sort of thing, spanning four decades. 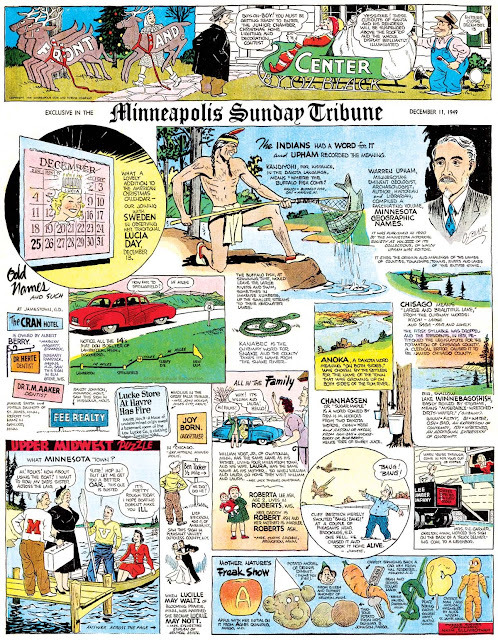 Front and Center probably began in 1941, shortly after Black moved from the Lincoln Journal and Star to the Minneapolis Tribune. At first the feature was untitled, but by 1945 it had been gained its running title. The page was a weekly fixture of the Sunday Tribune until January 18 1953. There was also a daily panel version of Front and Center, but according to my notes it seems the daily was actually just reprints of bits and pieces cut from the Sunday pages. Way to recycle, Oz!